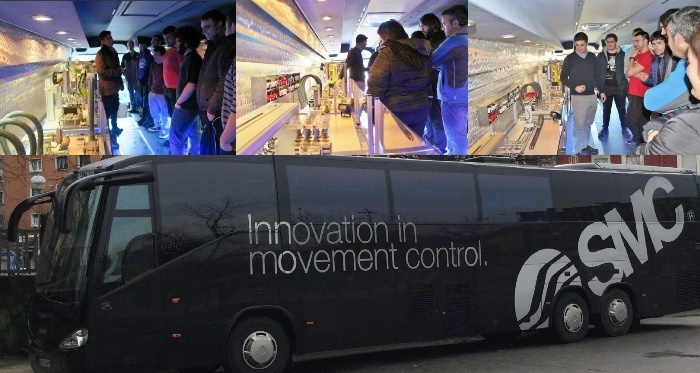 During this month of January, the INNOBUS from SMC visited different training centers and universities from the Basque Country. Visiting every day a center, the week of January 9, this vehicle dedicated to innovation went through Lea Artibai (Markina), Egibide-Arriaga (Vitoria-Gasteiz), Mondragon Unibertsitatea (Arrasate), IES Nicolás Larburu (Barakaldo) and EASO Politeknikoa (San Sebastian). The INNOBUS allows users, in few minutes, to learn about the latest SMC products, which are incorporated into real applications. Among the different products included in the panels displayed we can find electric actuators, solenoid valves, rodless actuators, electric grippers or vacuum pads.